Your chiropractor give you information so you have an informed decision prior to starting chiropractic care. The purpose of your consultation with the chiropractor is to discuss your health goals and determine if chiropractic is likely to help you. If it looks promising, a thorough examination will help identify the cause of your problem. 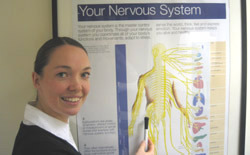 The chiropractor will take a thorough health history and examination. Unsure if chiropractic care is for you? At this visit the chiropractor will give you all the information you need to make an informed choice about your and/or your child’s care in our practice, including an overview of Chiropractic, how it works, how your problem has arisen, how you can help yourself and your future choices. On this appointment there is no charge and there is no obligation to take up chiropractic care.